Throughout this article, click on an image to see it in more detail. What is assuit? 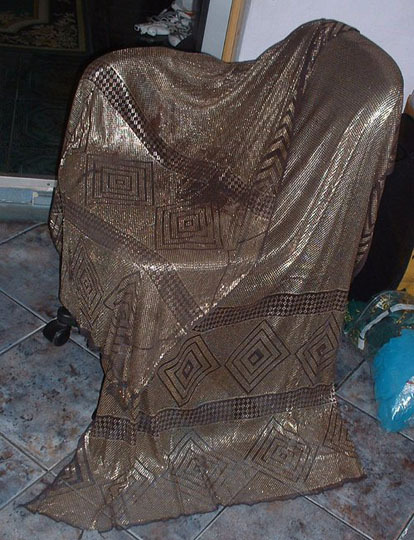 Aside from being a favorite costume fabric among dancers since the days of Taheya Carioca and Samia Gamal, assuit fabric is a beautiful silver studded fabric that used to be made in the Assuit region of Upper Egypt. Hence the name. The fabric gleams and shines like liquid metal when it moves. Antique pieces are very sought-after and can cost a small fortune. Modern pieces are much easier to come by and are very reasonably priced, as they are still made in Egypt today. 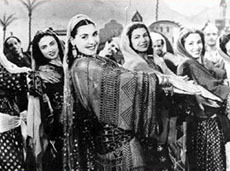 ABOUT THE PHOTO: This photo shows Tahia Carioca and an ensemble of dancers all wearing costumes made from this fabric. 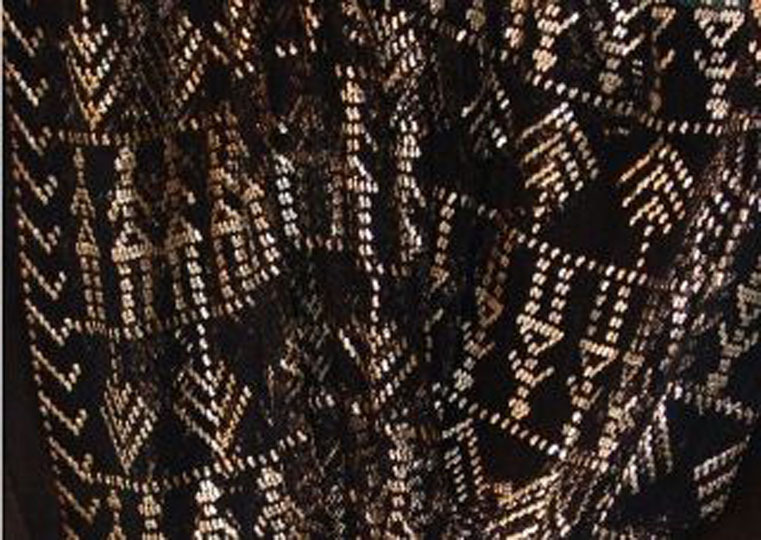 As a collector of tulle bitalli also known as "assuit" fabric, I have always been fascinated by the the history and manufacturing process of this amazing shimmery textile. I've read just about every article about tulle bitalli that I have been able to find online, and I took it for granted that most of these were accurate and well researched. It wasn't until a good friend of mine actually interviewed and videotaped an artisan who makes tulle bitalli for a living that I realized that much of the information that I have read online was not quite accurate. A recent artisan's fair in Cairo called Dairana Exhibition featured artisans from all over Egypt who came to show and sell their wares. There happened to be a tulle bitalli artisan named Madame Magida who was selling beautiful pieces of different types of embroidered textiles. She hails from the village of Shandawel Island in the governorate of Suhag and she was kind enough to give a detailed description of her work and of how assuit fabric is made. Madame Magida said that there are about one thousand girls in her village who make tulle bitalli and other embroidered textile products. One of these was her ten-year-old daughter who was with her at the exhibition that day and who was also quite talented in the art of silver thread embroidery. Madame Magida also clarified the meaning of the term tulle bitalli and explained where the name of this fabric comes from. ABOUT THE PHOTO: The actress Hedy Lamarr wears a costume made from assuit for her role in the 1949 film Samson and Delilah. The costume department, led by Edith Head, won an Oscar for Best Costume Design. First of all, let's do away with a common myth. Tulle bi telli doesn't mean "net with metal" or "net with silver". There is actually no such word as "telli" in Arabic. Madame Magida said that it is in reference to the appearance of the silver on the fabric that it's called tulle bitalli, because the silver looks as if it were plated onto the entire fabric. The word talla becomes talli when used together with the word "bi" and it turns into bitalli. However, when it's pronounced quickly, it can almost sound like bitelli. In Egypt it's pronounced tully be telli, with the "E" in telli being somewhere between an A and an E sound. Tulle bitalli fabric used to be made in the town of Assuit, which is located in Upper Egypt. This is why many people call the fabric assuit. This fabric isn't made in Assuit very much anymore. Most of the tulle bitalli that is sold today is actually made in Suhag by highly skilled artisans and then sold at tourist shops in Cairo or overseas. The needle and thread are then passed though the tulle fabric to form individual stitches. After each stitch is taken, the thread is cut and a new stitch is begun. However, it's not cut with a scissors; but rather, just quickly snapped off by the artisan's nimble fingers. 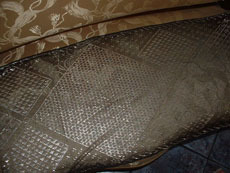 In this way, patterns are quickly formed on top of the fabric backing. The fabric is neither hammered nor passed through a roller. My friend asked Madame Magida specifically about hammering and rolling the fabric. She said that there was none of that involved in the manufacturing process. The artisan merely crimps each stitch with her fingers to clamp it more tightly onto the fabric, before continuing on to the next stitch. The silver threads are purchased at a mabsk (a metal smith) where they are made, and their current cost is about 150 dollars per kilo of threads. In past times, assuit fabric was also made with gold threads but these gold plated fabrics were purchased only by the very wealthy. ABOUT THE PHOTO: This is one of the pieces of antique assuit in Priscilla's collection. The net fabric is brown instead of black. The piece weighs about 3 pounds (1.36 kilograms). It measures about 2 meters long and a meter wide. It is worth at least $1,000, probably much more than that. An unfounded myth about assuit fabric is that the figural designs (the ones with people and animals) are typically made by Coptic Christians and the ones with geometric designs are made by Muslims. This is not true at all. Madame Magida, a Muslim, had made plenty of figural assuit shawls to sell at the artisan's fair as well as geometric ones, and she had both types on display that day. 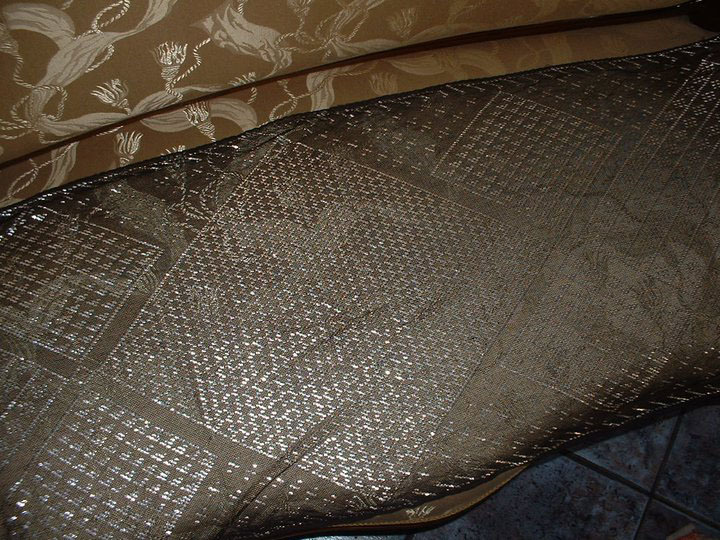 ABOUT THE PHOTO: This antique black assuit shawl from Priscilla's collection is stretched out across a couch to show the detail of the geometric design. It is slightly smaller than the piece shown above. A piece like this in perfect condition would cost about $250-$400. So, why is modern tulle bitalli coarser and stiffer today than the antique pieces that are soft and stretchy? Madame Magida was selling several very soft pieces of tulle but they were embroidered with regular thread rather than with silver thread. When asked why she didn't embroider the soft tulle with the silver threads, she said that she can. However, it's much more laborious and time-consuming because the holes in the soft tulle are very tiny and it takes much longer to pass the silver thread through the small holes of the soft tulle than it does through the larger holes of the stiff tulle. Madame Magida was kind enough to allow herself to be video taped while embroidering a piece of assuit fabric so that people could see exactly how this incredible textile is made. She also said that she takes special orders of tulle bitalli and can make them with any design that the client wishes. 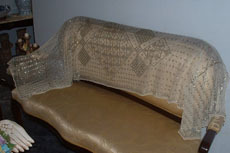 ABOUT THE PHOTO: This piece of antique assuit from Priscilla's collection is made on ivory colored tulle fabric. It is probably worth about $250-$300. Click here to watch video of Madame Magida demonstrating her craft of making tulle bitalli fabric. 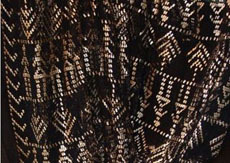 According to some researchers, this kind of metal woven fabric or metal embroidered fabric has been made since the times of the Pharaohs. 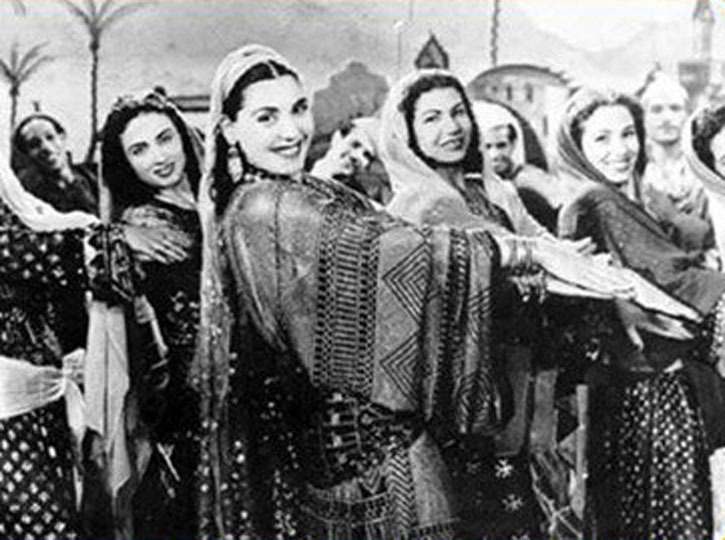 It used to be customary, in fact almost mandatory, that every bride in the Saidi region of Egypt have a piece of tulle bitalli before her wedding, most often a galabeya (dress) and a tarha (a long and wide head veil). This could be gifted to her by the groom or purchased by the bride's family for her. 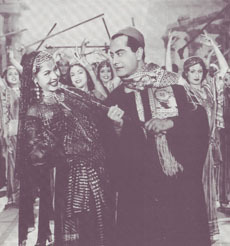 ABOUT THE PHOTO: This photo shows Samia Gamal with Farid al-Atrache. 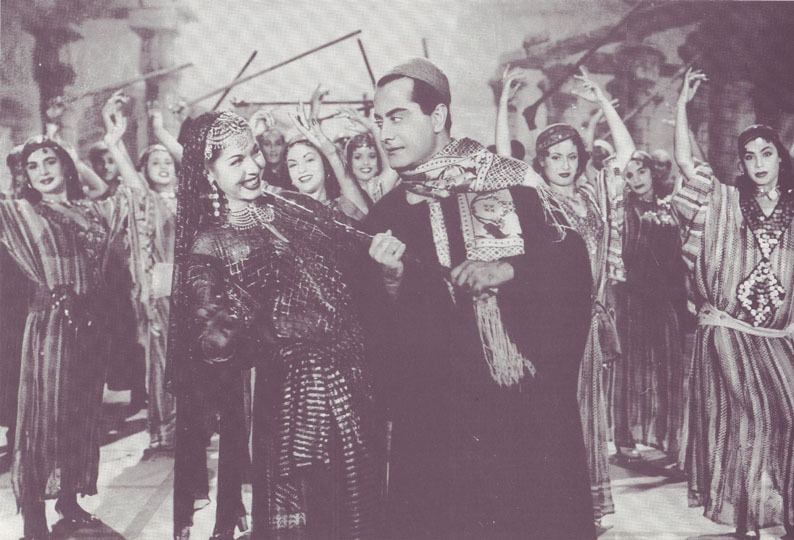 Samia is wearing a dress made of tulle bitalli.